Near Hokkaido Univ. Welcome coffee Bright feeling room, with large bed Helpful staff Free Wi-Fi 11min walk from JR Station 6min walk from Hokkaido Univ. 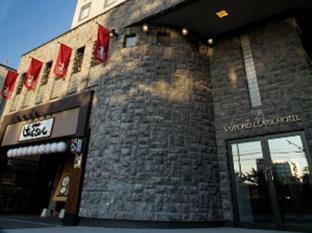 Sapporo Clark Hotel is a popular choice amongst travelers in Sapporo, whether exploring or just passing through. Both business travelers and tourists can enjoy the hotel's facilities and services. Vending machine, elevator, smoking area, laundry service, car park are on the list of things guests can enjoy. Each guestroom is elegantly furnished and equipped with handy amenities. The hotel offers various recreational opportunities. Convenience and comfort makes Sapporo Clark Hotel the perfect choice for your stay in Sapporo.